1. On leaving the airport, bear left towards the A7 motorway. 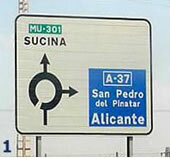 Join the motorway heading for Murcia. 2. 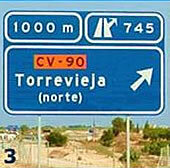 Continue on motorway until junction 724, AP7 (previously A37) towards Torrevieja/Cartagena. 5. Go through the entrance (the arches) and we are on the right, opposite the Santander bank.